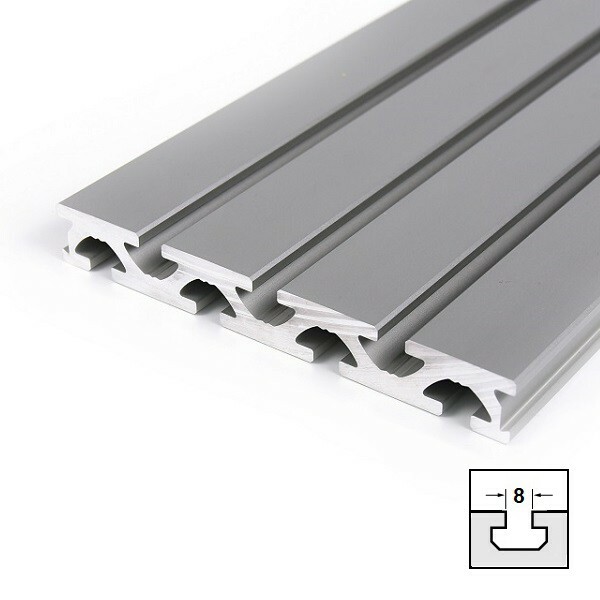 Product information "Slot plate 152x20 - slot 8, Aluminium nature anodized (length 6000 mm)"
The K40 construction profile series from the KINETIK MSystem®, is especially suitable for the universal application. Thereby provide this raster size through 4 different versions (SL, L, HX and PROFESSIONAL) the operator a maximum size on flexibility. The K40 SL (super light) construction profiles, have to the opposite of the L (light) series not only 35-40% lower weight, their have also up to 18% lower price. The construction profiles of the SL series are suitable for the building of apparatus hoods, fence of machines, exhibition stands and constructions where weight reduction plays a decisive role. Construction profiles of the L (light) series to be classified as basic construction profiles for universal constructions like mounting tables, machine constructions, robot cells, under constructions, trolleys/carts with normal use. The HX-series was special developed for the application in the linear sector. She stand as base for constructions with strong load. All construction profiles of the PROFESSIONAL series have closed T-slots, to can open at any place in the T-slot line for profile connections or for mounting of different parts. The using of this profiles is mainly in the clean room and design orientated area. Related links to "Slot plate 152x20 - slot 8, Aluminium nature anodized (length 6000 mm)"
Customer evaluation for "Slot plate 152x20 - slot 8, Aluminium nature anodized (length 6000 mm)"